MSSQL to MySQL database converter software transfers all data and values like rows, columns, key from Microsoft SQL to MySQL. Database migration utility supports primary key, foreign key, null values, defaults values of Microsoft SQL without adding any other value or key. Database converter tool prevents unauthorized users to change or modify software configuration setting. MSSQL to MySQL database converter utility supports database Unicode architecture and maintain database integrity. Database migration tool provides option for users to save the converted MSSQL database records at new location. MSSQL to MySQL database converter software supports all versions of MSSQL and MySQL database server. Database converter utility is safe and non destructive utility provides install and uninstall support. Database migration software can also overwrite existing data of MySQL database. 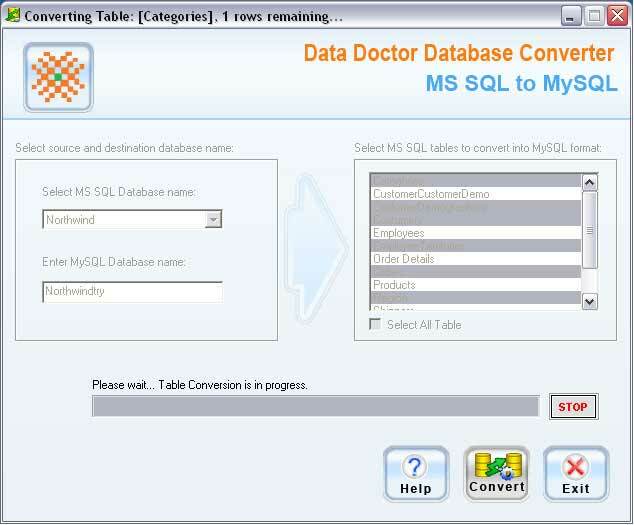 Microsoft SQL to MySQL database converter tool synchronize MSSQL database into MySQL. Database converter utility provides interactive graphical user interface (GUI) with inbuilt help manual. MSSQL to MySQL database converter software works without any other technical or software support. Database migration tool supports all Windows operating system like Window 98, 2000, 2003 server, XP, NT, ME and Vista. Features: * MSSQL to MySQL database converter software supports all versions of MSSQL and MySQL database server. * Database migration utility supports database Unicode architecture and maintains database integrity. * Database converter tool provides systematic help manual for user?s assistance. * Microsoft SQL to MySQL database converter software provides attractive graphical user interface (GUI). * Database migration tool provides full install and uninstall support. Added support for Windows Vista Operating System.